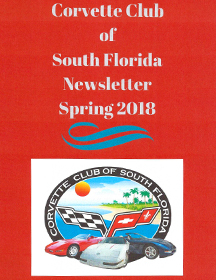 Welcome, and thank you for visiting the Corvette Club of South Florida website. Our club celebrated its 8th anniversary in April 2019. The growth of our club continues to exceed all of our expectations. Our membership has grown to over 80 members plus 7 junior members who are an extraordinary group of people, all dedicated to making our club a highly respected and outstanding organization. Our achieved goals are due to the dedication and support of all of our members & junior members. We are a proud group of people! On Sunday March 3, 2019 we presented our 8th Annual Corvette and Open Car & Truck Show at our sponsor's dealership - Lou Bachrodt Chevrolet Coconut Creek. We registered just under 300 cars & trucks plus had close to 2,000 spectators in attendance. Thanks to Jumpin Jack Productions & the best DJ in all of Florida - "Scott the Music Man" for helping us put on this spectacular show. Our entertainment included the fabulous David Morin’s Tribute to Elvis, the South Florida Cloggers & for the kids, young and old, a visit from the Transformers Bumblebee. We also had an elite group of vendors which included: Auto Geek (PBMG), A-Z Designs, BSO, Galli Shirts & Sports Apparel, GMAC, Joe DiMaggio Children’s Hospital, JOJI Frozen Yogurt & Sherbet, Performance888, Performance Details, Poorboy’s World, RedLine Motorsports, Statewide Windows & Doors and Tint World. We awarded 166 trophies, distributed over 400 door prizes, raffled 34 incredible gift baskets, had a great 50/50 raffle and gave away a big flat screen TV. Goody bags and dash plaques were given to all registered vehicles. Our amazing sponsor, Lou Bachrodt Chevrolet Coconut Creek, put on their own raffle with a chance to win a beautiful 2000 Corvette Coupe WHICH WAS WON at our show! How many car shows do you go to where the dealership gives away a car!! They also provided free hot dogs, hamburgers, chips & waters which were served throughout the day for everyone attending our show to enjoy. Be sure to visit our Photos tab to view the pictures from this wonderful 2019 event. 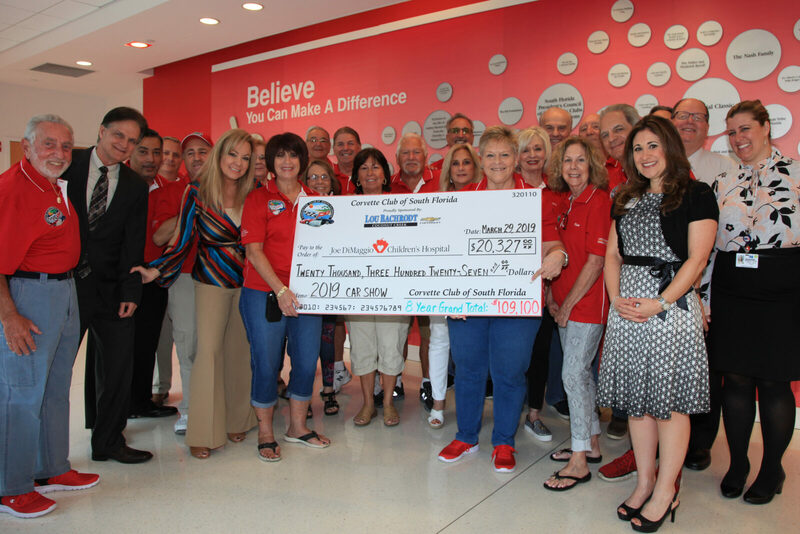 On Friday, March 29, 2019 the Corvette Club of South visited the Joe DiMaggio Children's Hospital in Hollywood, FL. We were extremely pleased to present this great hospital with a donation check in the amount of $20,327 and our eight years of contributions have now totaled $109,100!! On behalf of myself, Vice President & Treasurer Tony Sotallaro, my fellow Founding Members, club members & junior members, a special thanks to all of the car clubs and individuals who registered for our show. We could not have achieved our goal without your full support. Our very special thanks to Erick Nunez, Chief Operating Officer, as well as Les Nunez & Ira Greenbaum of Lou Bachrodt Chevrolet Coconut Creek for their continuous support and dedication to our club. We truly have a great partnership together which allows us to produce such outstanding shows. Please be sure to scroll down for more great info! See club member David being reunited with his original 1967 ‘Vette!